Sylvia made her debut as a professional at Makerere University when she went back to Uganda. In collaboration with Francis Nimukunda, as the first two EARTH graduates from Africa, they started a project to design and manage a small integrated farm from an agri-business perspective. The farm would be a demonstrative unit within the main University farm. From 2008 to 2010, Sylvia complemented her studies with a Master’s of Science Degree in Agribusiness Management at the University of Makerere. From March 2011 to November 2012, she worked for the Food and Agriculture Organization (FAO) as a National Agribusiness Consultant. Later she was hired by Agri-ProFocus, an NGO that specializes in agribusiness management services, including value chain development, farmer group development and market linkages. This initiative brings together professionals in the agricultural sector to promote farmer entrepreneurship and food security. 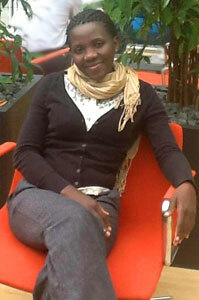 As a consultant, Sylvia is the main link between farmers and the private sector. Even though she is still part of Agri-ProFocus as a consultant, in 2013, Sylvia realized her dream to become an entrepreneur by creating her own project: Farm Reap Ltd. Her company has two main business areas: agribusiness consultancies and food processing. Within her company’s food processing area, she is processing and commercializing yogurt. Currently, she is promoting the product in several supermarkets and outlets. Her company is an outstanding result of her professional capabilities in: value chain development, market development, market access and entrepreneurship.